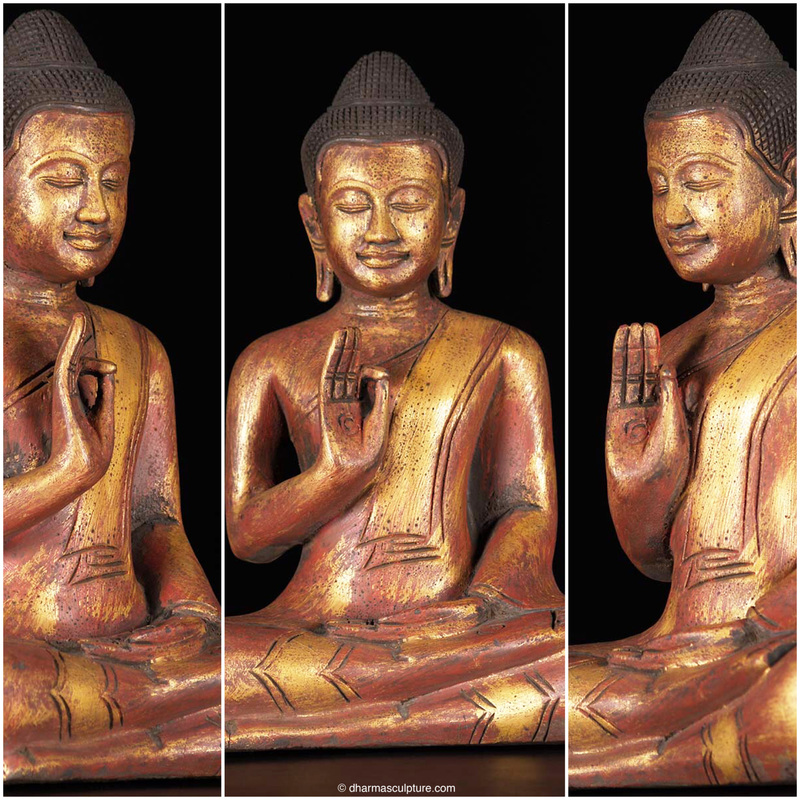 Lord Buddha’s hand is held up in abhaya mudra also known as the gesture of protection. The ushnisha, protuberance above his head also referred to as a topknot, symbolizes His wisdom and openness as an enlightened being. The Buddha is always depicted with elongated earlobes, a vestige of his life as a prince, when he wore extravagant jewelry. This wood sculpture is a one of a kind statue, hand carved by the very talented artists of Cambodia. This Buddha sculpture is shown in Parinirvana. In Buddhism, Parinirvana is the final nirvana, usually within reach only upon the death of the body of someone who has attained complete awakening or bodhi. It is the ultimate goal of Buddhist practice and implies a release from the cycle of deaths and rebirths as well as the dissolution of all worldly physical and mental aggregates or skandhas (perception or consciousness). Lord Buddha is shown resting peacefully. His eyes and face have a serene demeanor showing Siddhartha at ease with passing from this world escaping from the cycle of samsara. 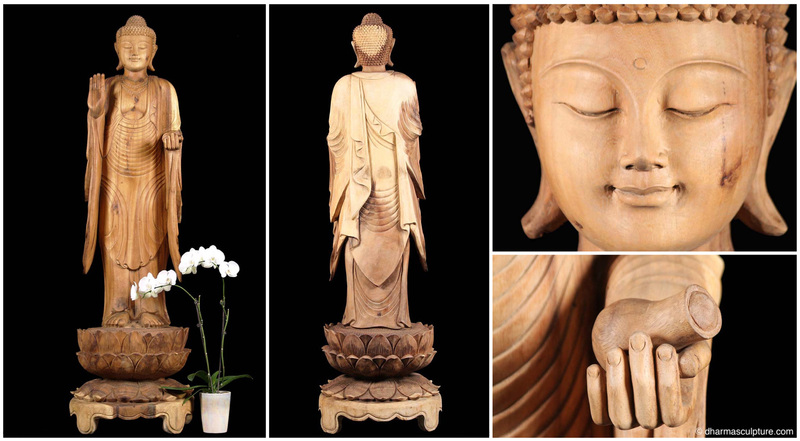 This beautifully serene Balinese wood Buddha stands on an intricately carved three-tiered lotus base. Lord Buddha’s right hand is raised in the abhaya mudra also known as the gesture of protection. In his left hand he holds a small vessel which in both Buddhism and Hinduism alike is said to contain amrita, the divine nectar of the gods which was also believed to have healing properties. This Buddha is carved from the trunk of a rain-tree. The natural gradation of the wood from dark to light color throughout this piece is stunning! Only master artisans are experienced enough to carve full tree carvings. The artist must have a very keen eye in order to see the contour and shape of the tree and bring life to it. The back of this sculpture is also fully carved. This sculpture was entirely hand carved in the living postcard island of Bali. 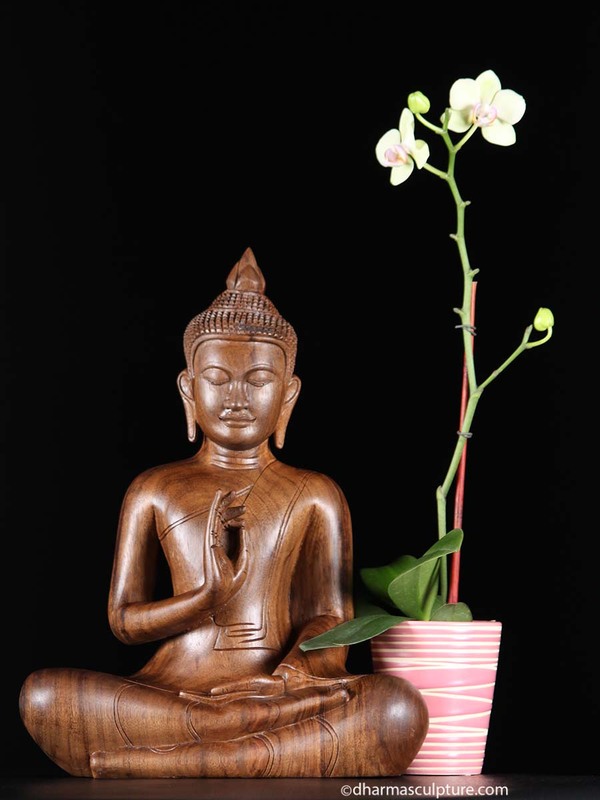 This natural color macassar ebony wood Buddha statue is in the vitarka mudra also known as the teaching gesture. Lord Buddha is seated in dhyana asana, the meditative pose also called padmasana. A beautiful Buddharupa, perfect for a home altar or meditation room. This wood sculpture is a one of a kind statue, hand carved by the very talented artists of Cambodia. Lord Buddha’s face exudes an intense sweetness and serenity. A slight, enigmatic smile plays across his lips. Long, pendulous earlobes reach down to touch his shoulders. 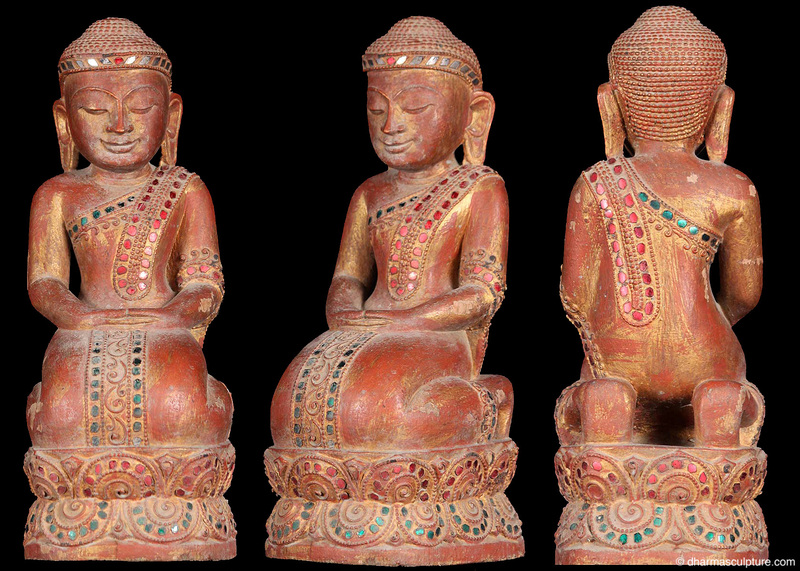 This beautiful kneeling Buddha is inlaid with red, green and silver glass mosaic. 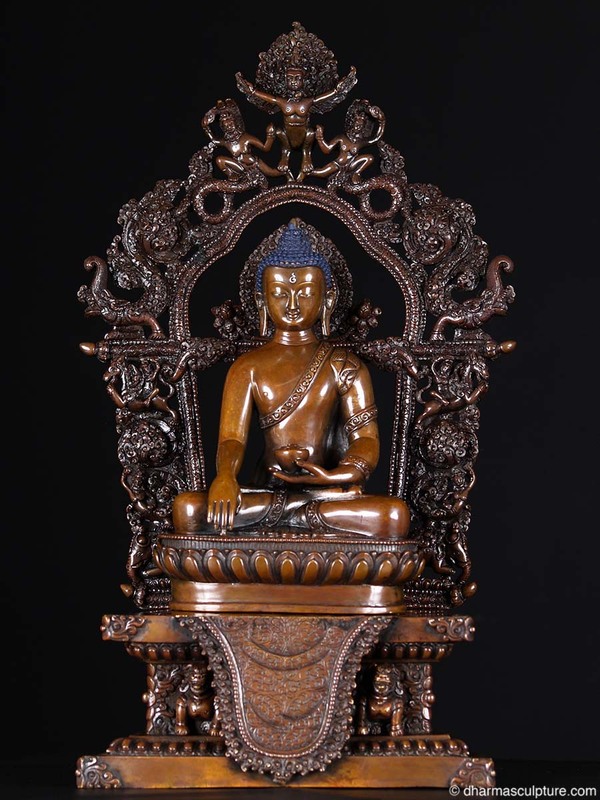 This teak wood sculpture is a one of a kind statue, hand carved by the very talented artists of Myanmar (Burma). 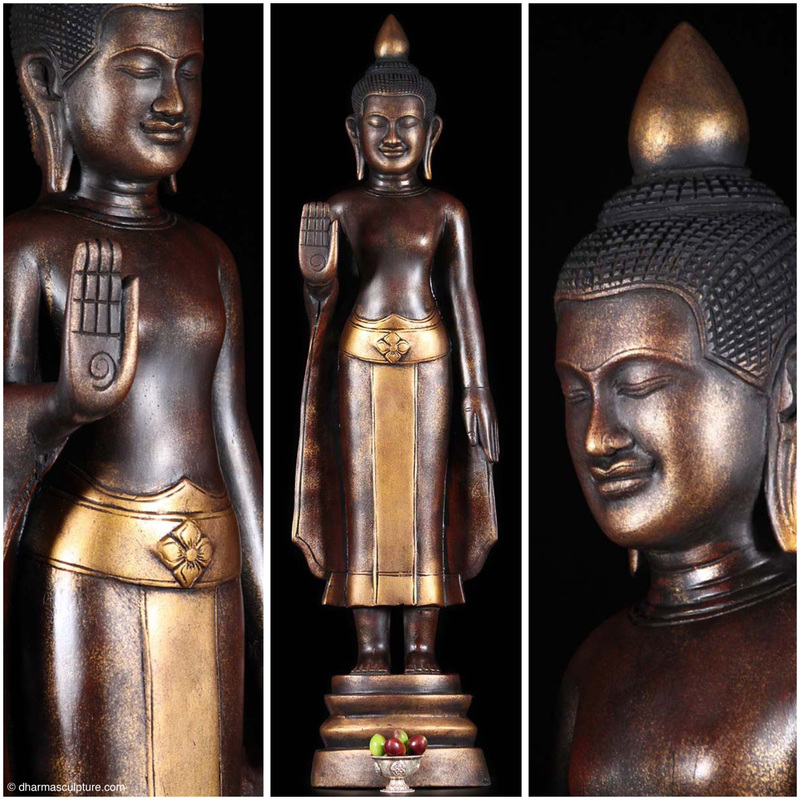 This Khmer golden Buddha statue is in the vitarka mudra which is interpreted as the hand gesture that evokes the energy of teaching and intellectual discussion or argument. It is said that it mostly feels like the transmission of a particular teaching with no words and that the circle formed by the thumb and index finger create a constant flow of energy and information. Amitabha is seated against a richly decorated torana dvara or “arch gateway” decorated with the familiar figure of Kirtimukha, a mythical animal holding snakes and two makaras, along with figures of horses and elephants. Accompanying them are three Chaityas which adorn the top of the arch/gate. He is dressed in clothes of royalty. The protuberance on the top of his head denotes superb mental acuity and his long earlobes denote superb perception. In this beautiful sculpture the eight-faced, sixteen-armed, four-footed Hevajra is depicted lithely dancing clasping his consort Nairatmya (“selfless one”) in a close embrace. One pair of legs assumes a powerful stance, the left knee bent (alidha), the other pair assumes a dancer’s pose (ardha pariyanka). Crushed underneath are four corpses representing the four Maras or demons who embody all the active hindering forces within the psyche and in the objective world, that work to deflect us from the spiritual goal. In his eight right hands he holds eight skull cups each containing an animal: an elephant, a horse, a donkey, an ox, a camel, a man, a tiger and a cat. In his eight left hands he also holds eight skull cups with the eight deities of the cardinal directions. Nairatmya, the consort of Hevajra has two hands and two legs. In her left hand she holds a skull cup while the right hand holds a vajra. Her left leg is bent down along with his, while her right leg is wrapped around his waist. Her expression is also wrathful. They both wear elaborate belts with beaded festoons, garlands of severed heads and skull tiaras. Carrying skull cups in all of the hands is one of the most distinctive features of Hevajra. The skull cup represents the mind aspect of the body, speech, and mind notion. It also represents death and impermanence, the illusory nature of all the phenomena. The animals and gods in Hevajra’s skull cup may symbolize a universal range of all matter and beings, alive, on earth and in the heavens. Thus, the sixteen skull cups collectively symbolize the sixteen voidness or Shunyata. Hevajra is a wrathful emanation of the Buddha Akshobhya. He is a popular deity in Tibet, where he belongs to the yidam (tutelary, or guardian, deity) class. His worship is the subject of the Hevajra Tantra, a scripture that helped bring about the conversion of the Mongol emperor Kublai Khan (1215–94). 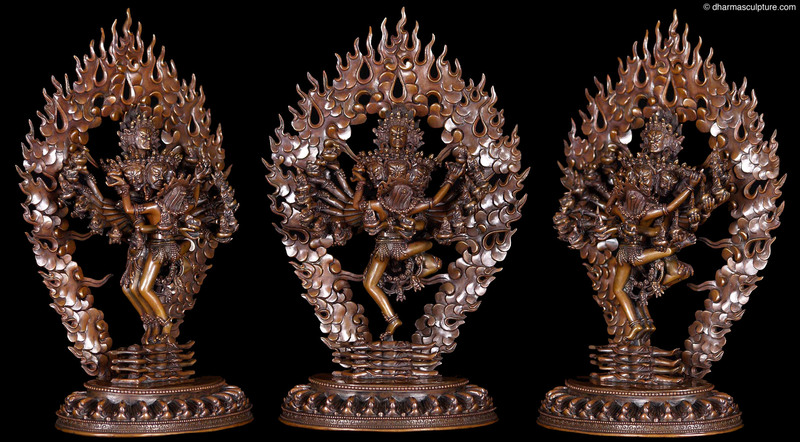 He is one of the more common yet complex deities depicted in Buddhist art! This serene golden Burmese Buddha statue is seated in padmasana with the left hand resting on his lap and right hand extending over the knee in the bhumisparsa mudra. Lord Buddha’s erectly held head, framed by large curved ears and tall ushnisha, surmounted by a water drop shaped finial, has the sharply chiseled features and downcast eyes associated with late Ava period figures. 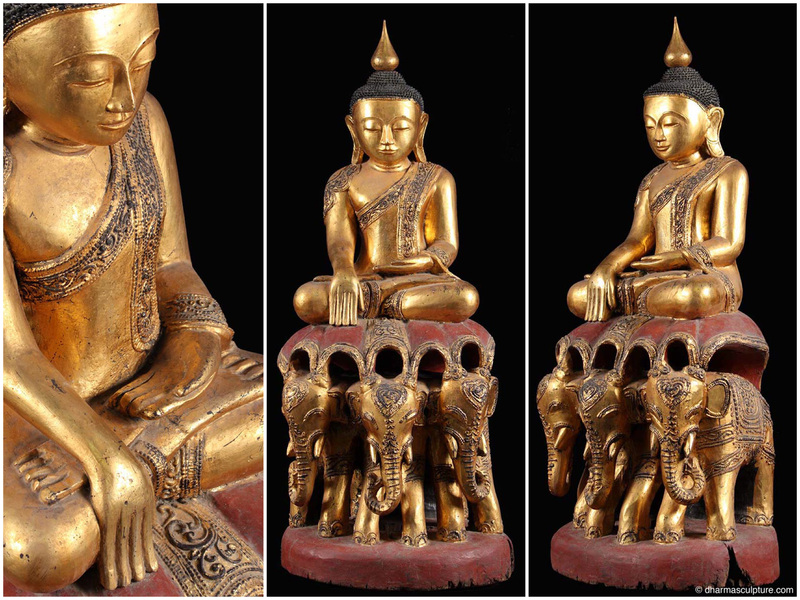 The Buddha is seated on a scalloped lotus leaf that resets on a magnificent throne formed by the broad shoulders of a trio of caparisoned elephants (gajasana). This wood sculpture is a one of a kind statue, hand carved by the very talented artists of Myanmar (Burma). Every piece is truly unique! Lord Buddha’s hands are in the dharmachakra mudra. This is the gesture of teaching. Dharma means ‘law’ and chakra means ‘wheel’ and is usually interpreted as turning the Wheel of Law. This was the hand gesture exhibited by Lord Buddha while preaching his first sermon after his enlightenment in the Deer Park at Sarnath, near Varanasi. This discourse is known as the ‘first turning of the wheel of dharma, when the Buddha taught the doctrines of the Four Noble Truths and the Eightfold Noble Path to five Indian mendicants. This one of a kind Buddha statue is hand carved out of rain tree wood by the very talented artists of Bali, Indonesia!